What is your favorite part about being a Residence Hall Director? I love playing a role in college student engagement during their resident experience. Serving as the Residence Hall Director gives me the opportunity to help feel connected to campus and other community members. 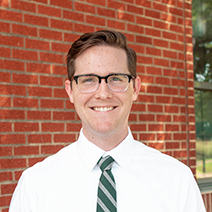 Community programming and a positive living experience contribute to a student's sense of belonging on campus and academic success, so it's great to be a major person in organizing and managing the resident experience at Baylor through my RHD role. What does authentic Christian community mean to you? My vision of "authentic" Christian community is modeling a community of people around the practices and fellowship of the early Church. If we can establish a shared identity, a faith-driven purpose, loving accountability, and consistent fellowship then THAT is an "authentic" Christian community.